I’m always curious why sausage stuffing is typically only served maybe once or twice a year, typically around the holidays. In all honesty, sausage stuffing, or sausage dressing if you will, is probably my favorite part of the Thanksgiving or Christmas holiday. No lie. I could probably just live off of that during those couple of days, with a ladle of gravy, I’m set. I’ve been making this recipe for years now, and I might add a slight twist or two depending on my mood, but this is the one, and one that many people love. This recipe uses fresh herbs, a couple of different types of bread, chicken livers, sausage, and an array of vegetables, all drowned in chicken stock to be baked, then crisped at the end. It’s a wonderful spoonful in every bite. This recipe feeds a small army, probably 12 or more, so from this, you can figure out what you need, or freeze the leftovers and use them up on any day where you require a bit of comfort food. Heat two skillets on your stove, on medium heat. To one skillet add the canola oil and let it come to temperature. Once heated for a few minutes, add the pureed chicken livers and mushrooms, and give a good stir. To the other skillet, add the chopped bacon. Cook the livers only for a few minutes, stirring along the way, then remove the skillet from the heat and set the livers into a bowl. Cook the bacon, just until slightly crisp, then strain some of the bacon fat, reserving for later use if you want. To the skillet with slightly cooked bacon, add the chopped kale, and half a cup of water. Continue cooking until the kale gets nice and wilted, about 12 minutes. Preheat your oven to 325 degrees. Once heated, add the sour dough bread cubes to a baking sheet and place into the oven, cooking for about 12 minutes or so until the bread is nice and golden crisp. To the skillet where you were cooking your chicken livers, heat on medium high heat, add the 2 pounds of Jimmy Dean sausage. Cook the sausage until nice and crisp, about 10 minutes. Once cooked, place into a bowl and set the sausage to the side. To your large skillet, add the butter. Cook on medium heat and let the butter melt. Add the onions, garlic, parsley, fresh herbs, and celery. Cook for about 10 minutes or until everything is nice and tender. Season with the salt and pepper. I used a large aluminum pan that I purchased from the store to mix all of the ingredients. 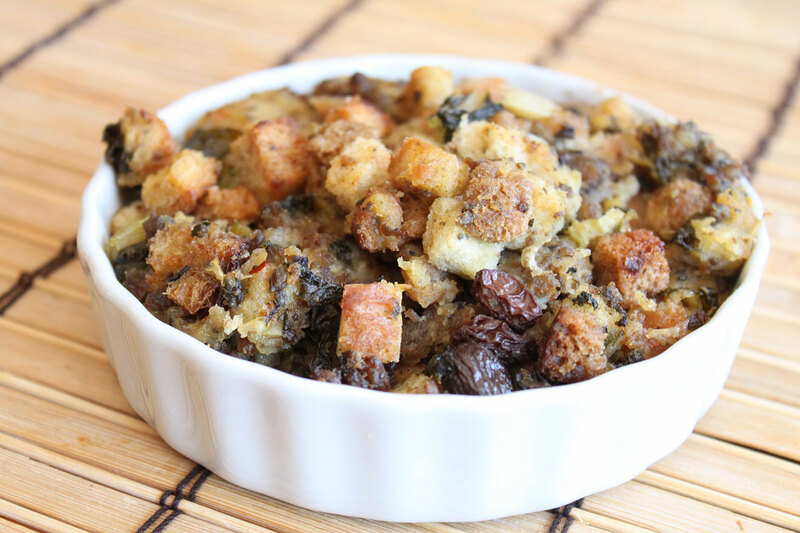 To the large pan, add the bread cubes, bacon and kale mixture, liver and mushrooms, raisins, and sausage. Give this a good mix, making sure you incorporate all of the ingredients. Next, ladle in the warm chicken stock. You want to make sure the mixture gets softened, but not mushy. You don’t want mush. Cover the pan with foil. To the preheated 325 degreed oven, add the stuffing pan, and cook for 30 minutes, covered. Next, uncover cook for an additional 15 minutes so the top gets a bit crisp. The end result is pretty flipping amazing. You get sweet, savory, and great texture all around. 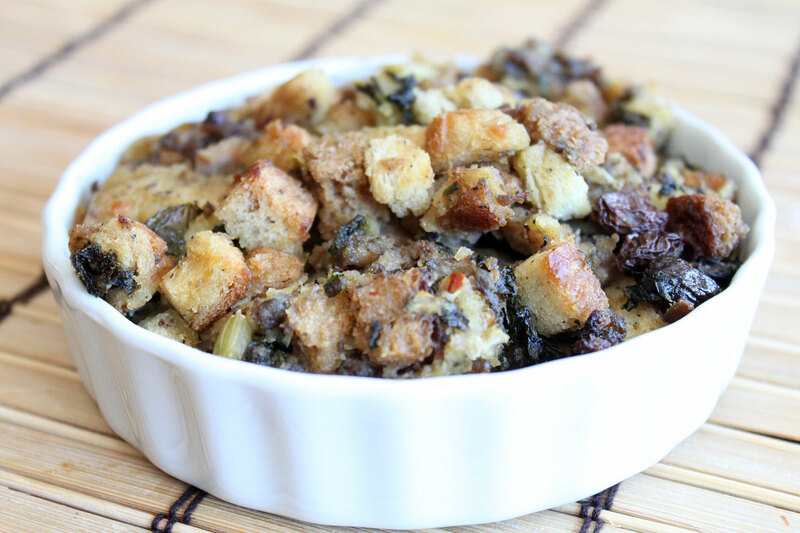 This is my go to stuffing recipe and it’s one that I crave during the fall and winter months. My Mom always made Sausage Stuffing, since getting married divorced and so on and on, not one feed since then have I had sausage stuffing. Many turkeys, never sausage in the stuffing. Thanks for the recipe and you can bet this will be on my table this Christmas.